Rudimentary Elongated Cervical Ribs at C7 have various treatment options. I was diagnosed by my chiropractor with this condition last year and it makes sense from the x rays and the extreme pain I was going through. I had pain going through my left collar bone and radiate down to the middle of my back to pain and a tingling sensation running down my arms into my hands. With all this being said, I have been receiving chiropractic treatments for this. What I'd like to know is: Can I use a therapeutic neck support/brace to help with the pain? If so, how do I go about in getting one and what kind should I get? I can see little advantage in a neck brace; that's used to stabilise the neck after a whiplash for example, when ligaments have been stretched. 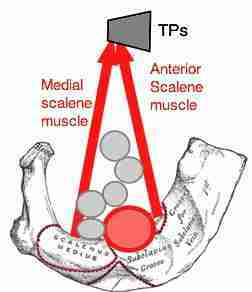 Because the cervical ribs are in the thoracic outlet and may pass through the interscalene triangle, they can certainly affect the nerves to your arms. What may need to be determined is just how large they are; the bony part is seen on xray, but there may be a cartilage extension. This can only be determined by a scan. At our cervical ribs page you can see a similar case; it's very treatable but not curable, except with quite extensive thoracic surgery, not without its dangers.